Bev would love to speak and most all meet people who are passionate about connecting generations as she is. Bev thought it would be great to show part of the Generations United application, that tells her story from the very beginning. This sounds like such a simple question but often you can hear extraordinary stories over a simple cup of tea. When I first started Celebrate Living History, it felt like I was on a series of dates with people much older than me. I would attend high school reunions for the over sixties and try to pick up seniors at the snack table. Often I was met with suspicion but once everyone got to know me, doors would open. I would hear stories about what it was like growing up in another era and I was privileged to learn history from a unique perspective. It was a revelation to be able to forget ages, theirs, and mine and listen to the person inside the senior. Some of these people became my closest friends. I went on to develop Celebrate Living History (CLH), an internship program targeting both high school and university journalism students. My program was established with a view toward opening the doors for students to experience the value of listening to elders. This was achieved also by teaching content development for the student’s portfolio through the CLH website. Through the platform that CLH provides I am able to mentor and assist students crafting a story that makes both senior and student proud of their time together. One of my greatest achievements was working with the Frankston High School students. These young people became an active part of the exhibition I created to celebrate the stories of local seniors. Participating students had the opportunity to include their favourite senior in the exhibition. One of my greatest joys of CLH is my ability to make seniors feel important. I remember one senior at the exhibition saying, “Thank you for creating an avenue where my voice is heard.” “Often I am in a crowd of people yet I feel invisible, as if what I say isn’t important.” It is these comments, which inspire me to keep going. No one should feel that way. Social isolation is another issue I am passionate about. Studies suggest there are over 60,000 cases of social isolation among the elderly, just in the region of Victoria where I live. Programs such as mine have the power to make a person feel valued in the community. For some, it is a rare social contact with the younger generation and a chance to learn about multimedia technology. My initiative in creating CLH and programs for youths and seniors is evidence that I am able to inspire delegates to think outside of the box in the fields of social inclusion, history preservation and journalism. 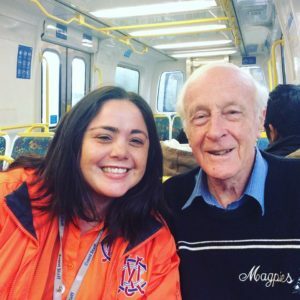 CLH is the only program in Australia, which connects journalism students with seniors to curate invaluable stories. My passion for preserving stories for the future is born of my innate wisdom and the will to share my time with diverse generations.